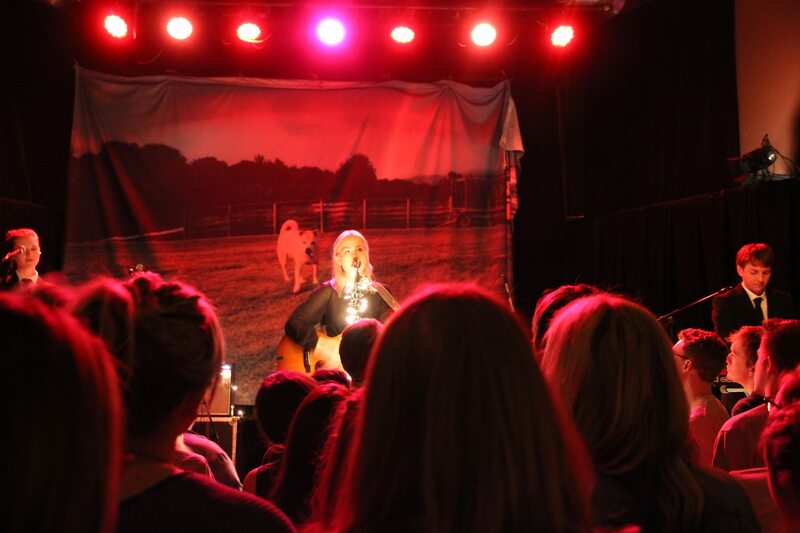 Intimate concerts feel like an oxymoron, especially a sold-out show with an artist on a nationwide tour. Yet, they still manage to happen. Artists somehow convince me they’re sharing their most vulnerable moments with me in a crowd of hundreds or thousands. The connection is one rooted in empathy with everyone in the room and those on the stage that makes even the biggest shows feel small. Phoebe Bridgers’ music fits this bill to a T. Whether it be songs delving into her relationship with her younger brother or a friend lost to the opioid epidemic, Bridgers doesn’t shy away from intimacy and pain. In her live performance at High Noon Saloon, Bridgers seemed to mask the pain. Bridgers and her band walked out dressed in all black formal wear. 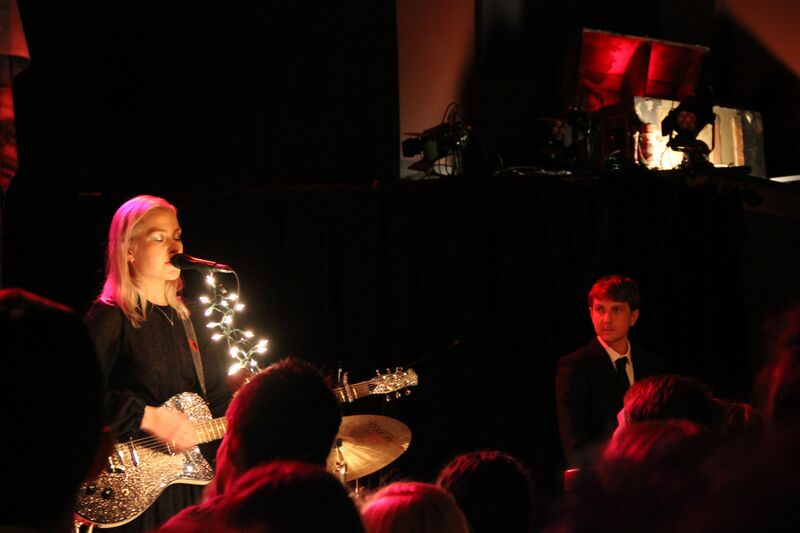 Her band wearing matching suits, with her in a dress — a clear ode to a funeral. 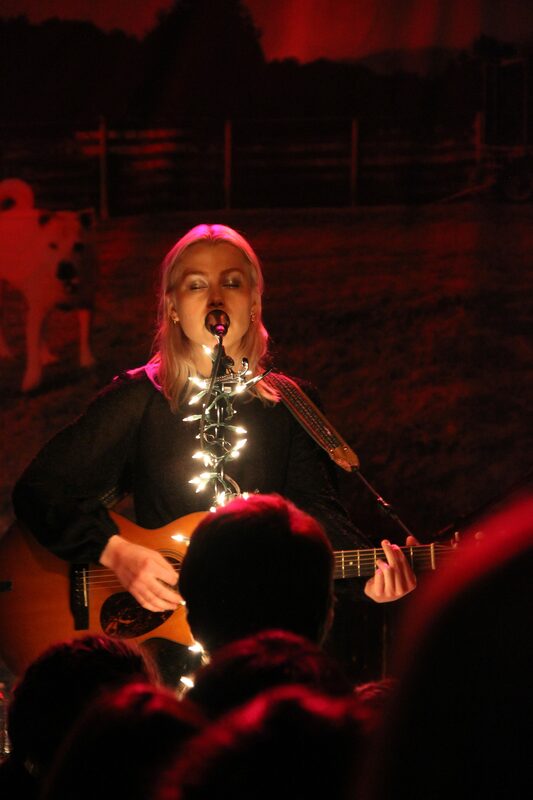 String lights were strewn about the stage, covering amps and microphone stands. The screen behind the performers showed the dog from the cover of Stranger in the Alps, the warm and dim lights presented a stage that felt whimsically serious. Everything seemed to fit the tone of Stranger in the Alps, yet Bridgers altered some of the most touching tracks from the record. This would work for some songs, others suffered due to the artistic changes. For the most part, the changes were attempted to make the songs livelier. This took away from the sparse and ethereal nature of the studio versions. Of the altered tracks, the transformations to “Georgia” were strengthened by giving a country-rock feel. The band sounded full. Bridgers voice shined through. The suits and lights made it feel like it was in a world between the Grand Ole Opry and a barnyard concert – uniquely marking a space of its own between stardom and intimacy. More often, the changes weakened the songs. “Would You Rather,” a song about her relationship with her younger brother, felt hollow as its tempo was sped up. Even Bridgers’ stage banter before the song shied away from its intimacy by simply saying it was embarrassing for her brother when she played the song in a show at his school. I understand the difficulty of artists revisiting their most painful memories on a night by night basis for the entertainment of others. I understand changing the tracks in an attempt to give them new life. I’ve seen this done in brilliant and creative ways. Most notably, Sufjan Stevens’ rave-like performances of Carrie & Lowell songs, but Bridgers seemed more confident in her covers than her own songs. Her performances of Tom Petty’s “It’ll All Work Out” and Sheryl Crow’s “If It Makes You Happy” were the most confident and enjoyable songs of the night. It seemed like the more rock and country influence in a song, the more Bridgers and her band felt comfortable to let loose. “Scott Street” is the most notable example of the identity crisis to Bridgers’s performance. A song about moving on after a relationship is a fan favorite, yet the performance of it felt hollow as giant balloons were bounced around the audience. The balloons popped into a mini-confetti explosion. It didn’t enhance the show, rather it distracted from a song that demands attention. Bridgers showed some immense potential. She does well with country songs with a strong full-bodied sound, yet the confidence on her record was lost in her live performance. 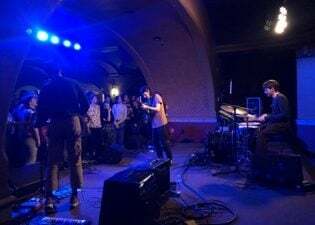 This was only highlighted when juxtaposed to her opener, Lomelda, who managed to create an intimate space all alone with just a guitar and a drum machine. Intimacy is one of the toughest things to convey in entertainment. In an industry where crowds desire a consistent image or persona from an artist, it must be difficult to have that persona be rooted in pain and sorrow. I hope Bridgers continues to experiment with country-influenced music as that’s where her performance shined the brightest.